Sorry things have been busy @ Home & Work. I had been thinking about doing something special for the holidays but looking around it’s a little too late. So instead here is something nerdy from my youth, the Commodore Christmas demo diskette.. When I was lucky enough to get a C64 along with a 1541 in 1983, this was one of the bundled diskettes. At the time I never realized how lucky I was to have the floppy drive, so many poor Europeans with their tape drives. I hope it’s been a good holiday for everyone! 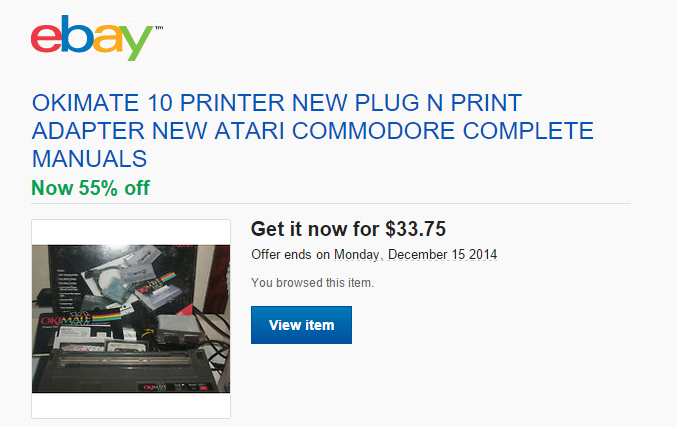 Author neozeedPosted on December 26, 2014 Categories Commodore1 Comment on Belated Merry Christmas! Ok, I know… why? But it’s more of a why not! 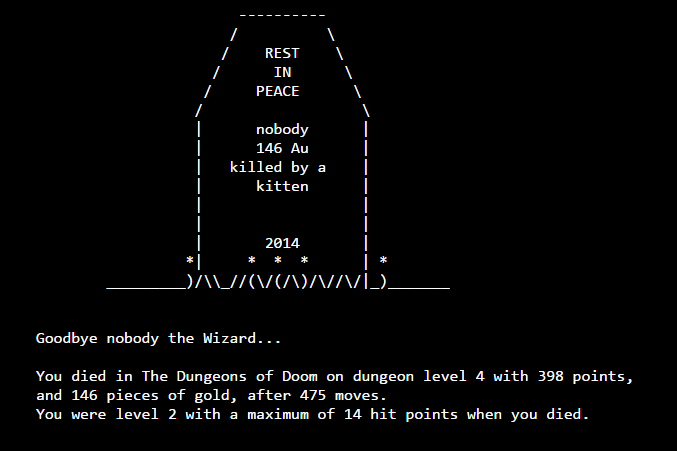 So I figured since I’ve had major issues trying to get DOOM to run, I’d try something bigger, like NetHack. I figured its a good fit, it’s all ASCII based anyways, so how complicated can it be? Actually it turned out to not be that complicated. Thankfully having both run68’s source and NetHack source I was able to adapt enough of the system stuff to get it running. I decided to use this build of NetHack 1.3d that has been updated to compile with modern compilers, since the cross tools use GCC 4.6.2. NetHack 1.3d synchronized PC hack, and UNIX based NetHack enough that I could start to build under MS-DOS, and then re-target it, as Human68k and MS-DOS share a lot of features (although Human68k has support for tasks, and shared memory. It’s more like OS/2 although no memory protection… ). I’ve gotten it to the point where you can save, load and quit. Oddly enough the ANSI support in Human68k isn’t as good as ansicon so it actually runs better on run68. So my next step will be to figure out more of the console controls on Human68k, and remove the ANSI support. Ideally I’d love to figure out how to talk to the sound drivers on the x68000. Add some music. Maybe sound effects, and graphics? So for anyone who cares, my source directory, binaries and a xm6 disk image is all here. I’ve seen in the cvs tree on sourceforge that run68 has some support for BSD. That’d be another interesting thing to add, common exe’s between windows/linux. But console access first! Thanks to Peter for the link! PPC CPU emulation. CyberStorm PPC and Blizzard PPC boards emulated using QEMU PPC core, on-board SCSI supported. I’ve never used the PowerPC stuff before, I had a 68030 accelerator in my Amiga 2000 going back some 15 years ago, and I never could justify the cost for the board vs a new PC as the Amiga was so super fringe back then. All of the additional features are with the announcement here.. Author neozeedPosted on December 20, 2014 April 22, 2016 Categories 68000, Amiga, m68k, powerpc, UAE7 Comments on WinUAE 3.0.0 released! So for my email setup I use an OpenBSD firewall behind a hardware firewall (provided by the telecom), and from there I use OpenVPN to connect up to the VPS that in turn forwards email to my Exchange server. Except that the OpenBSD VM just crashed. And to top it off I had no other way of accessing inwards except for some test machine that luckily was still on, and I had SSH enabled, along with port redirection. Checking VMware KB 1012382 details a list of what ports are needed by which versions of their products to do what. These are the two ports needed for basic checking in on the status of a standalone ESXi machine. So in this case I can point the VMware fat client to attach to 127.0.0.1, and add in redirects for TCP ports 443 & 902, which let me login, and start a remote console to see how the VMs are doing. And then point the client to esxiloop, and it ought to connect. 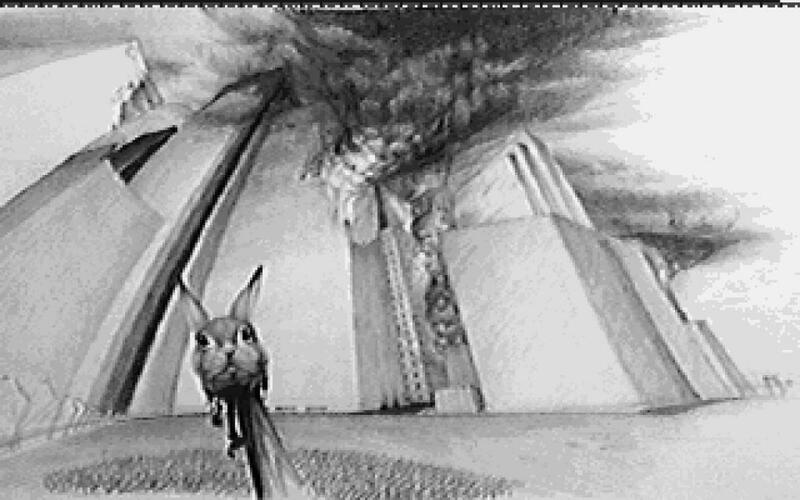 REV_E – June 25, 1987. REV_E is the first major overhaul to the interpreter. * The source is now significantly lint free. * TERMCAP support has now been added [#define TERMCAP option]. command line option which disables screen paging (-p). * Attributes in the object list are listed as bits. now be removed [#define ALLOCALL option]. switches have been replaced with arrays of pointers to funcions]. mods to fix problems with signed chars. Version 1.00 – August 17, 1987. Version 1.00 on August 17, 1987. So this means it’s very 16bit & 32bit friendly, especially on BIG endian machines like the 68000 processor. Luckily this older version is pretty trivial to compile, and get running. But I was over thinking the build process and decided to strip the executable as GCC would kick out a 500kb file, which objcopy would extract a 81kb executable. Stripping it brought the size down to a 50kb executable but it wouldn’t run in either xm6 or run68. I ended up going in circles for a while trying to find fault in what is broken where until I manually compiled the interpreter, and omitted the strip step and suddenly had a working interpreter. Now there is one issue, saving doesn’t work. Something in the libc is having issues using fopen with a file to write. Reading works perfectly fine though. So to fix it, I went ahead and redid the save feature to use the HumanOS native _open/_write/_close functions and I’m able to now save & restore a game. Copyright (c) 1988 Infocom, Inc. All rights reserved. door. You could circle the house to the north or south. In this process I’ve also managed to build run68, and verified that it’s operating correctly, as both run68 and XM6 both failed to write to a file with fopen, and both work using the native calls. I’m sure most people won’t care but I think it’s great having the ability to run a GCC generated C program in a relatively small interpreter. If anyone cares, here is my updated cross compiler + run68 source along with tweaked Info Task Force 1.0 source. 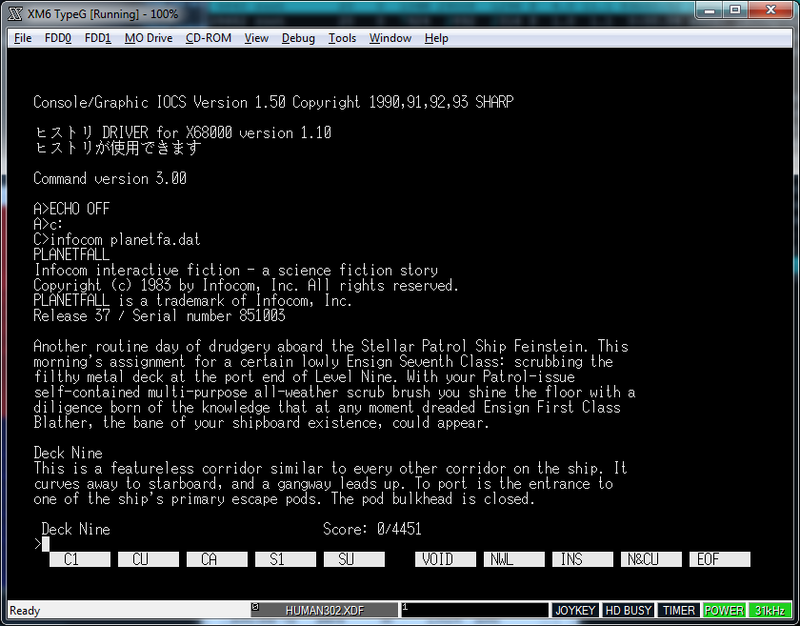 Or a disk image that XM6 can boot up, and run some demo programs from Infocom of ages ago. Author neozeedPosted on December 15, 2014 December 15, 2014 Categories 68000, cross compiler, gcc, Infocom, syscall emulation, x68000Leave a comment on Tracking down the InfoTaskForce from 1987. This isn’t terribly useful for 99.9% of the people out there but I needed to do something creative on an F5. Luckily they run a somewhat sane version of Linux. Unfortunately I am stuck on Windows 10 right now, so installing a matching Linux distro is out of the question. So on my OS X box, I thought I’d just build a cross compiler. Going back to my DJGPP cross compiler, I thought I’d stick with binutils 2.9.1 and gcc 2.95.3, since they worked so well before. Plus to flesh it out, you’ll want libc, libg++, and the appropriate Linux includes. I took all of these from Slackware 3.3 since it’s from around that era. So on the plus side this cross compiler + library set , will crank out static ELF executables, which makes running things on alien platforms all the better. On the realistic side, I doubt anyone will need it, but here it is. Clang didn’t want to build anything this old, but luckily that backported GCC-4.2 has no issues. It’s on his twitter account. 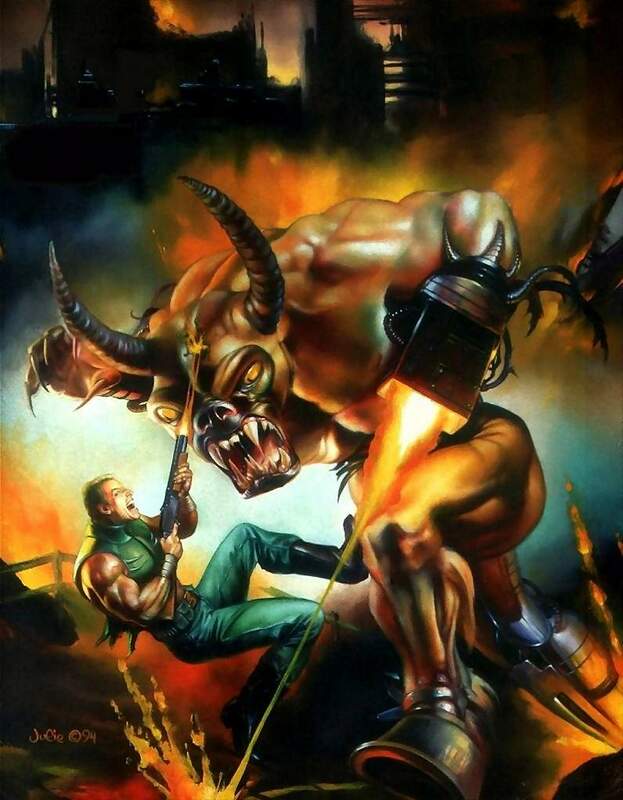 This pic was taken for an interview in 1994 while making DOOM II. Jay, Adrian, Bobby, Kevin, John, me in front. 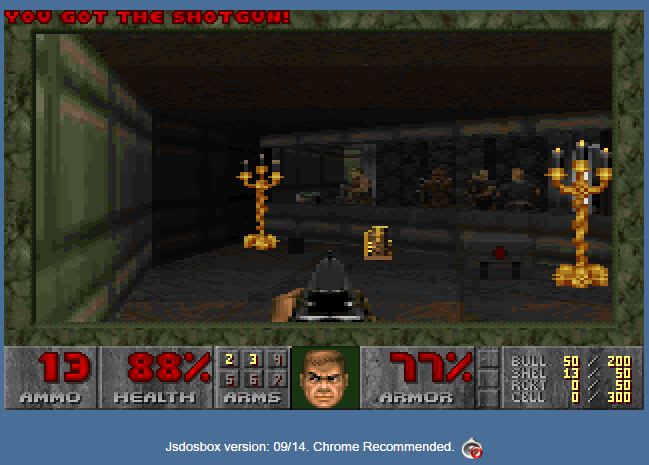 I would normally link to the jdsobox stuff so you can check out Doom in a browser, but Oracle has successfully screwed up Java so badly that it’s a nightmare to get any 3rd party applets to run. Ive always been a terrible player maybe getting 5 levels down max. It’s a complicated game that is for sure. 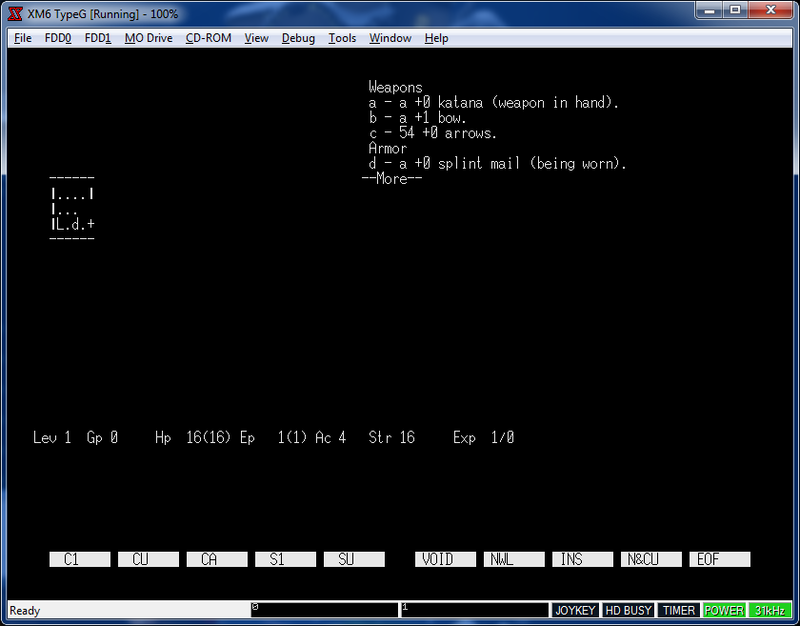 So I thought with the shellinabox thing, I’d add in some gratuitous nethack. As always the nethack wiki is a good resource to get a better handle on what all the symbols mean, and what to do. So I got this SPAM today.. Ebay now tracks if you’ve clicked on anything (even when not signed in) and will alert you (and the seller no doubt) that something is price reduced. 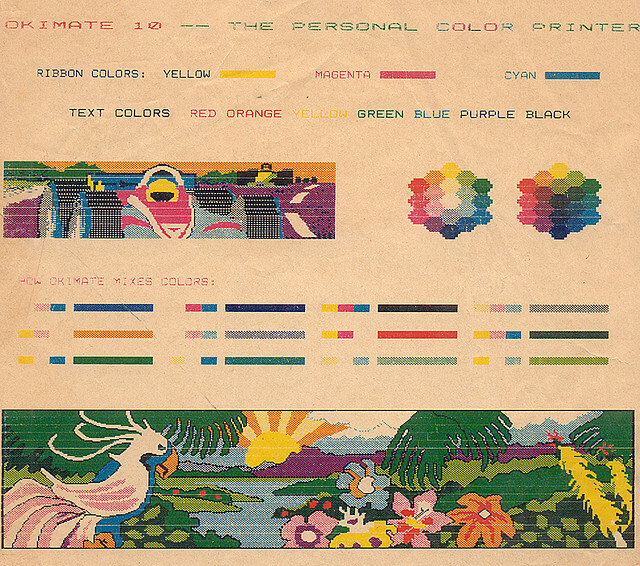 I was looking at some old setup, and I remembered back in the 80s I had an Okimate 10 printer. It was without a doubt the worst printer I’ve ever used. Not only was it god awfully slow, it required special ink cartridges that were almost impossible to find (and if you did they were very expensive) but to print properly it required special glossy paper. And here you can see how the OkiMate 20 was busy devouring a colour band from it’s virtual cartridge. 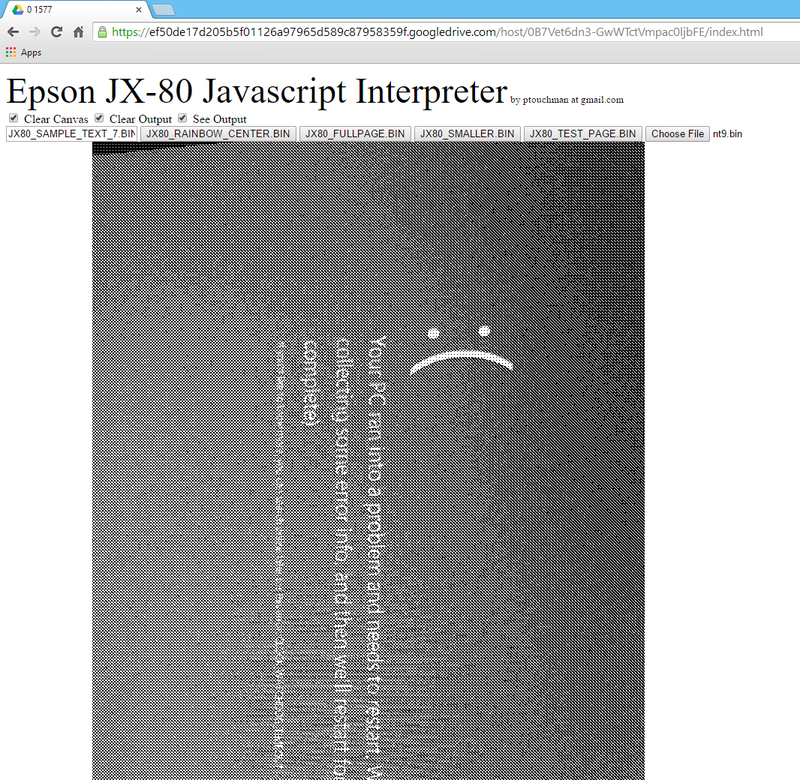 Peter has quite a few virtual printers on his blog, The one that caught my eye was the Epson JX-80. Windows NT supports that printer (probably many other OS’s but I was going to stick with something quick and easy). I took my 10 crash screen, and printed it out! For some reason the printer emulator only is printing in monochrome, it’ll interpret the colour bands, but it doesn’t switch ink colours. I guess it automagically is doing that. Also I had to change the default Windows resolution of 144×240 to 144×120, to get it to print. Of course if you wanted to the best thing to do is install an Apple Laser Write II printer, and have it output to a file, as they are PostScript printers. Then you can use ghostscript to convert your postscript file to a PDF, and print that email it, or remember what a pain write only devices are.